The Discovery Times Square exhibition center in New York currently houses an exhibit of costumes from all of the “Star Wars” films. I have seen several exhibits of film costumes, but never anything quite like this. Imagine that you’re George Lucas, a visionary with all sorts of vivid pictures in your mind. You then have the ability to hire the best of the best designers and artisans to make your visions real. I can’t imagine anything more gratifying. You can see the craftsmanship in every inch of the costumes, which were made with the same care as haute couture creations. Along with the costumes themselves, placards throughout the exhibit give you some fascinating background. For example, the designers used inspirational sources from Erté to Elizabethan England to African tribes to ancient Egypt to Japan to Imperial China and more. Lucas instructed his designers to model the bad guys after the Nazis, so you will see elements of Nazi uniforms in some of the costuming. 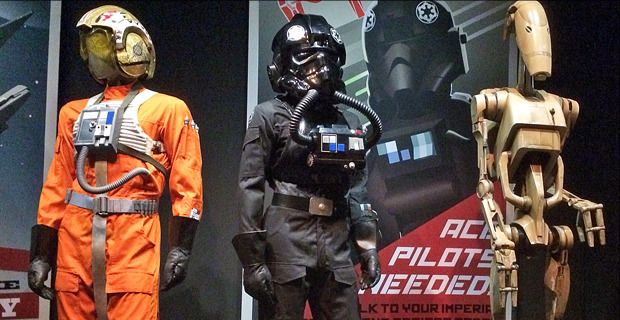 Luke Skywalker’s orange jumpsuit, which he wore for the attack on the Death Star, was borrowed from early aviators. The Jedi costumes were made of mostly earth tones and had a monk-like appearance, which showed their purity and desire to live simple lives. For example, Lucas wanted Obi-Wan Kenobito look like part monk and part Samurai warrior. 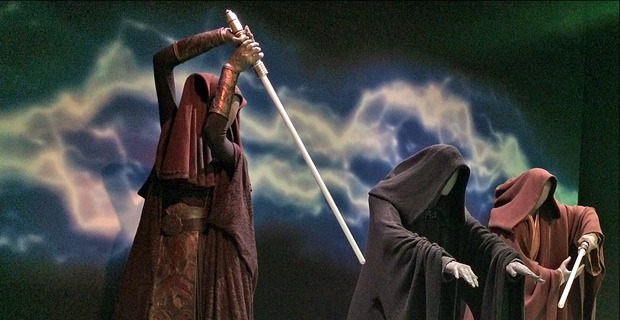 The Sith, on the other hand, were clothed in mostly sleek, flowing black, but since the Sith began with a Jedi gone bad, there are elements in their costuming that hint back to their Jedi past. For the Stormtroopers, Lucas requested “spooky white space armor,” and designer Ralph McQuarrie used his knowledge of medieval armor to create the look that we all know so well. For the droids, such as R2-D2 and C-3PO, the designers used materials like fiberglass, vac-formed plastic, and aluminum. C-3PO’s look was inspired by a robot in the 1927 silent film, “Metropolis,” by Fritz Lang. One exhibit placard discusses the difficulty in making the costumes look a certain way while also making them functional for a long day on the set. Polyester and silk were sometimes used to look as though they were wool, linen, or cotton, simply because they dry faster and don’t wrinkle as easily. For each costume, the designers would have to think about what the actors would be required to do physically. Could they do it in the costume? The exhibit includes some interactive elements. Kids will have fun pressing buttons to make lightsabers turn on. (OK, I enjoyed that, too.) A few other exhibits include swatches of the fabric used in the costumes that you can touch. You’ll also see some of the weaponry behind glass. Take a look at more photos below. These are just a few of the many costumes on display, and the images don’t do the costumes justice. While you’re allowed to take photos in the exhibit, you aren’t allowed to use flash. So, you just need to see these in person. If you’re in New York or plan to be soon, check it out. Discovery Times Square also has a Hunger Games exhibit at the moment. Melanie Votaw is a New York City-based freelance writer and the author of 15 non-fiction books. She’s a former actress/singer/dancer who started performing at age 4 and now loves to write about film, TV, and theater. Visit her Web site, Rule the Word, and follow her on Twitter and LinkedIn. Melanie Votaw has written 302 posts on Reel Life With Jane.